If you'd like to add a big dose of glittery cheer to the tree this year, here's a great choice! The 10 grandkids - loving hearts at Christmas personalized ornament is also a wonderful way to celebrate the grandchildren or to let grandparents know how many special people love them. These grandparents ornaments personalized from Russell Rhodes arrive with the details you provide lettered on by hand where shown, though a stylish font will be used. The result will be a customized Christmas gift that both generations will cherish. 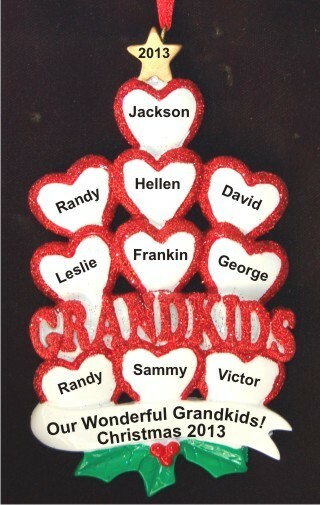 Capture the special love of family this year with the grandkids hearts ten grandchildren personalized Christmas ornament in our classic velvet gift and storage bag. For my mom Jul 20, 2015 Brenda P.
the Grandparents love it! Nov 13, 2014 Krista P.